Cuan Law, the most luxurious scuba diving liveaboard in the British Virgin Islands (BVI) is by far the best way to enjoy BVI. Cuan Law spans 105 feet in length and 44 feet in width. Has Two 103′ masts spread 5,200 square feet of sail over the massive deck. Her size and the triple hull design provide extreme stability, both at anchor and while underway. The Cuan Law has 10 large cabins with en-suite baths, each of which can be a configured as a queen bed or two twins. There is plenty of storage space, and a surprising amount of room in these cabins with individually controlled a/c and natural ventilation through the large skylights. All the rooms are off the main saloon, a spacious area with very comfortable couches and loveseats and is considered the social hub of the boat, with a full bar and other amenities. Off main saloon is the alfresco deck where most meals are served. Breakfast and lunch are buffet style while dinner is more formal with staff serving you, all, while you enjoy an oceanfront view. The upper deck is perfect for laying out getting a suntan or drying off after each dive. Our trip will sail out of Tortola for Sunday December 1st, 2019 to several islands where the dive sites of the BVI can accommodate all levels of scuba divers — even beginners because the waters are especially calm. The morning dive is usually 9:00 am, with the dive briefing taking place just after breakfast. We will have the opportunity to dive the wreck RMS Rhone that sank in 1867, the Chikuzen one of the Caribbean’s best-preserved shipwrecks and the BVI’s newest wreck, the Kodiak Queen with a kraken on it. Other sites include The Aquarium, Brown pants, and Angelfish Reef. With over 100 dive sites it’s not possible to link them all. 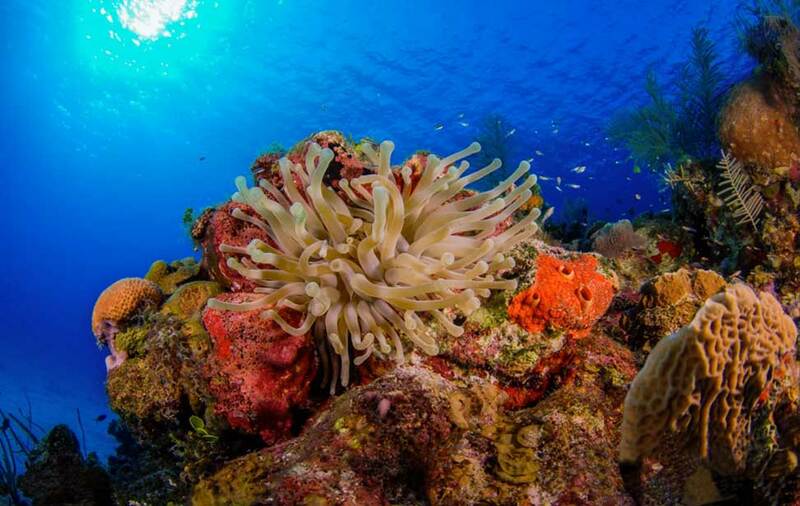 Cuan Law is unlike any other dive liveaboard in the Caribbean in its weekly schedule. There is no set number of daily dives: You can log as many as 19 dives during the week or as few as 15 if they would like to explore the islands. Plus, because these islands are so close together, the itinerary maximizes time for other adventures-kayaking, wakeboarding, Hobie cat sailing, and snorkeling. Unlike most dive liveaboards spend the majority of the pre-flying no-dive day at port, we will enjoy 2 morning dives (shallow) and while off gassing enjoys an afternoon at The Baths, the iconic grotto created by basalt boulders, flanked by white-sand beaches on Virgin Gorda. Alcoholic and non-alcoholic beverages Once on board the Captain makes it very clear the bar is “your” bar and ty help yourself. After you have completed your dives for the day. The liquor list was very impressive. I didn’t see a single off brand liquor behind the bar. A full set of dive gear, including dive computer, is required for this trip. Don’t own your own dive gear yet? We can rent it to you! DEPOSITS: $300.00 (NOW), $300.00 (November-15-18), $1,133.00 (February-15- 2019), $1,133.00 (April-15-2019), $1,133.00 Balance due August 15, 2019. *If you want to book your own flights so you can use points/miles deduct $700.00. Keep in mind you can’t use points/miles to book directly into Tortola BVI. You will need to book into San Juan, Puerto Rico (SJU) then take an inter-island flight to Tortola (EIS) BVI. Then hire a taxi to take you to the hotel. **Are you a solo dive traveler? We will find a roommate for you and a dive buddy to boot! SWS & FES TRIP PAYMENT REQUIREMENTS: Other than the what is listed above no other costs are included. SWS & FES will not be collecting payment for any other part of your trip. If you must cancel, all deposit money is non-refundable unless we are able to fill your vacated space. If we can fill your vacated spot at the full purchase price, SWS or FES will credit your refund to an in-store account minus a per person $300 cancelation fee. If we are unable to fill your spot on the trip, all money paid toward the trip will be forfeited. Note 2: Every diver on this trip is required to have Diver Accident Insurance coverage. If you do not wish to join Divers Alert Network and purchase their Diver Accident Insurance, proof of another plan you have that covers you for an out-of- the- country accident including medical flight evacuation back to the U.S. or to a better medical facility should that be required is acceptable. NOTE 3: For peace of mind, SWS & FES strongly recommends you purchase additional trip cancelation/interruption coverage to help defray costs arising from unforeseen events. No one plans an emergency. But you can prepare for one. Carefully read any insurance policy before purchase to make sure it covers your specific needs. *SWS & FES is NOT a seller of insurance. We are giving you information about insurance coverage as a service only. Dive Assure has dive accident, trip interruption, and live-a-board trip interruption insurance packages. NOTE 4: SWS & FES highly recommends purchase of this trip specific additional coverage. In the event you have to cancel, the additional trip insurance coverage could help you receive reimbursement for non-refundable deposits and costs should you have to cancel or interrupt your trip to come home for reasons not covered under the Diver Accident Insurance Coverage. NOTE 6: SWS & FES ACTS ONLY AS AN ORGANIZER AND EXPEDITOR OF DIVE TRAVEL FOR THE SOLE PURPOSE OF OFFERING A SERVICE TO SCUBA WORLD SACRAMENTO, INC. CUSTOMERS. SWS DOES NOT SELL DIVER ACCIDENT INSURANCE NOR DO WE SELL TRIP CANCELATION AND INTERRUPTION INSURANCE NOR ARE WE LICENSED TRAVEL AGENTS. WE SOLICIT THE ASSISTANCE OF LICENSED REPUTABLE TRAVEL AND INSURANCE AGENTS TO ASSIST US ON YOUR BEHALF.